Jasmine is a flowering plant that belongs to the Olive family. There are about 200 species. Jasmine prefers sunny areas, in fertile well drained soils, so clay is not ideal. Jasmine do prefer moist soils and need regular watering while flowering, they don't do well during long periods of drought. Jasmine grows as a shrub and as a vine. Flowers are mainly white and form in clusters which usually bloom in spring and summer. 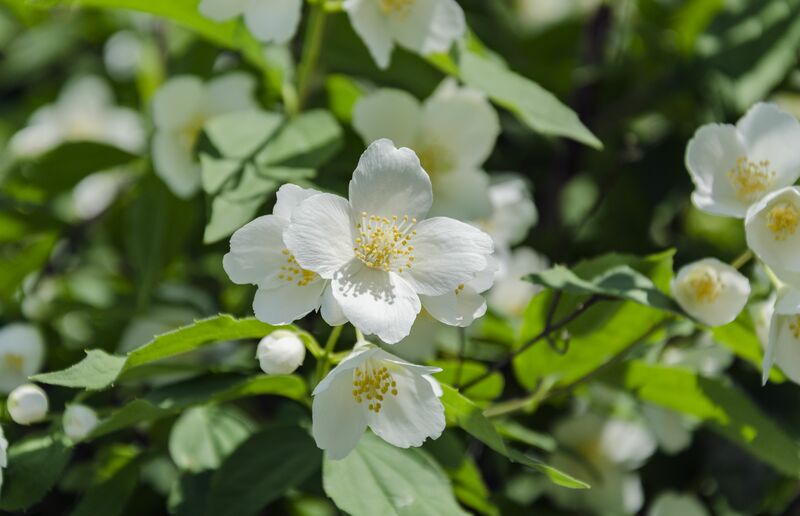 Jasmine does have a few insects and diseases that can be a problem from time to time, so an insect and disease control program is recommended. Do you really need to rake all those leaves? The answer to the question is no. The catch is, as long as the leaves aren't covering more than 20% of your lawn. Excessive leaf matter can be bad as it will smother your grass. McGuire's Beautiful Outdoors uses mulching kits on all our mowers which chops leaves into small pieces so they fall down into the canopy. This is beneficial because the nutrients and organic matter benefit the lawn and soil. Some leaf types have been shown to reduce weed germination when mulched into the canopy. 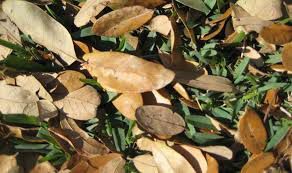 Most leave drop also occurs while Florida lawns are in their dormant state, so no new growth is being affected. So before you get that rake out, give mulching a try! 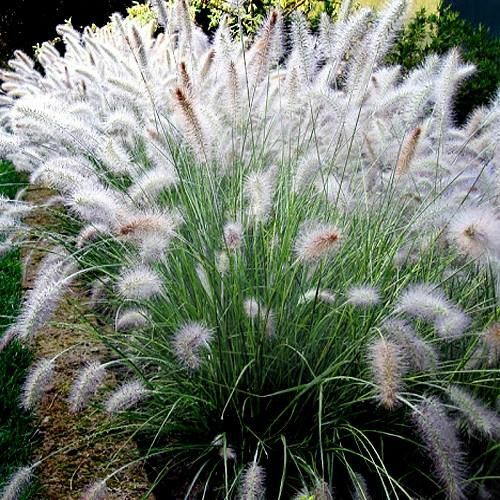 Grassy shrubs may be exactly what your landscape needs. Low maintenance, all our practically pest free with minimal disease issues, and they can be planted in almost all soil types from full sun to partial shade areas. Overall most varities tolerate drought conditions which is always a plus in Florida. Pruning can be done if they become too large for an area, or left alone and only pruned to remove dead or unsightly foliage. Aeration is a must for a healthy lawn. 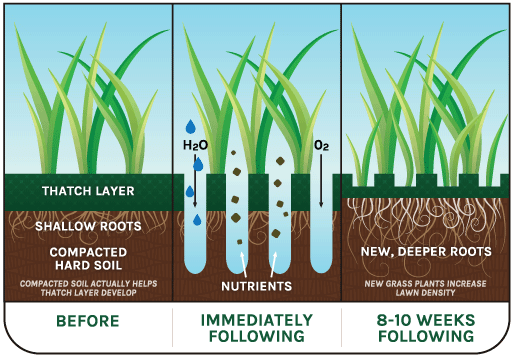 Aeration removes small cores of soil, turf, and thatch from your lawn, to help the uptake of water and nutrients. It helps to thicken your lawn, and improve the effectiveness of irrigation and fertilizer and pest control applications. Aeration should be done annually, but sometimes if soil is compacted, twice a year may be needed. Here is an example of how not to trim an oak tree. This canopy is ruined due to over pruning. This Oak has lost all it's aesthetics. Too many lower limbs were removed in order to raise the canopy where reduction cuts would have been the proper solution. In addition, the picture on the right shows an improper cut which actually tore the bark away. 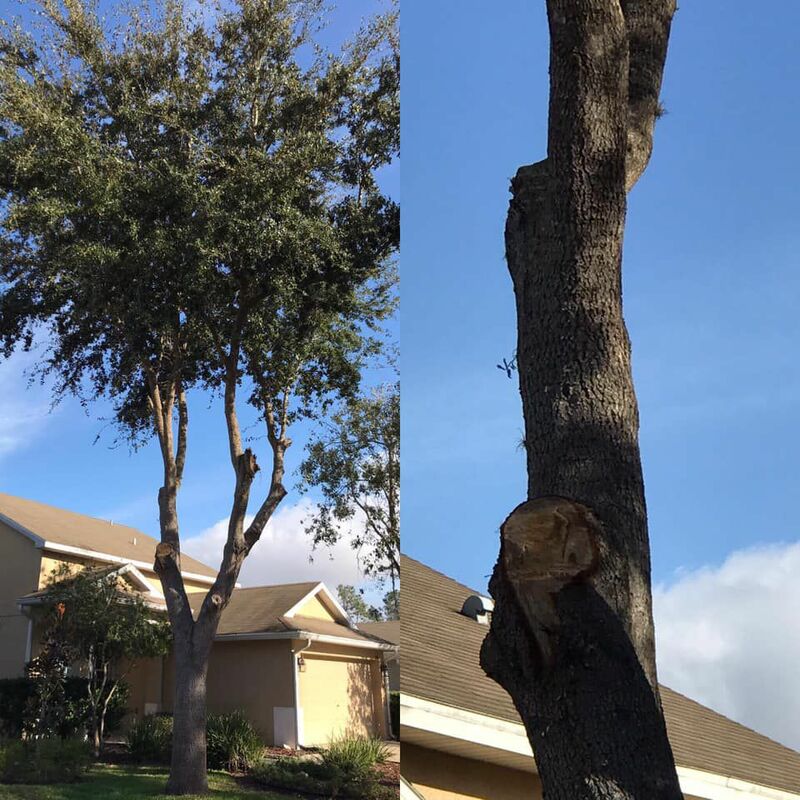 Tree's are already under stress from day to day enviromental factors, to trim excessively or improperly stresses the tree more and leaves it susceptible to disease. Give us a call and prune with a purpose! We are ISA Certified Arborists, fully licensed and insured! 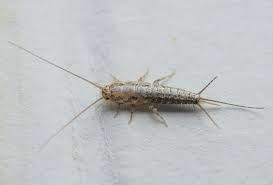 As daylight hours are shorten and temperatures drop, winter insects seek shelter from cold conditions in places like hollow trees, under mulch, and inside your home. Unfortunately climate controlled structures are attractive for invaders. Keeping your home protected on a quaterly basis with a perimeter insect bait and spray will help keep pests where they belong, outside! 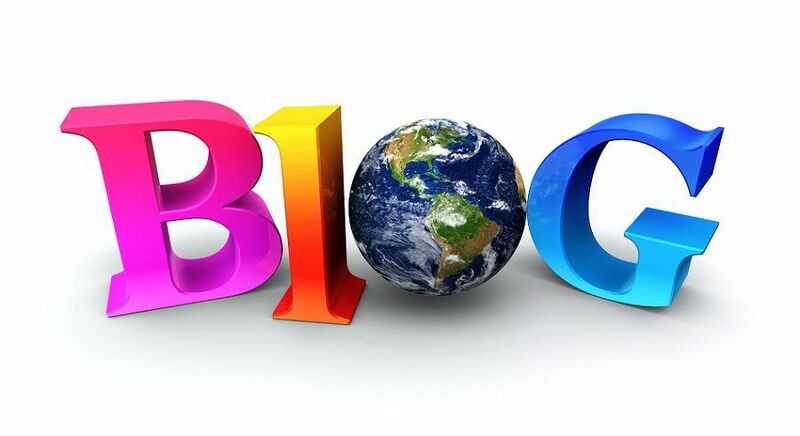 Give us a call for your free quote!